Well, I'm not too sure where day 2 went, but it's gone and it's almost day 4. So let me squeeze day 3 in before I forget what my name is. Yesterday was spent making the corrections on our sketches after the critique. The teachers are available to offer guidance on your piece. Sometimes, you get conflicting comments from the teachers but it's all good advise. In the end, it's up to you but I've usually gone with most of the suggestions since, well... they are the professionals. Here is my revised sketch. I printed it out on 140 lb. Lana watercolor paper. Have wet it down and stretched and taped it. It will be ready come the morning. Mo Willem gave a hilarious lecture today, plus he had some fantastic advise on writing children's books. This man understands the mind of a child. James Gurney delivered his fantastic lecture on Color and Light. 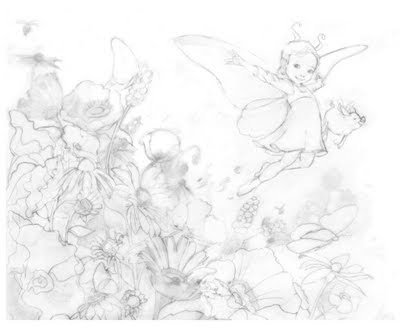 But the highlight for me was Peter de Seve. Great speaker. So funny. His art truly speaks to me. I got the giggles so badly looking at his process and work. Tomorrow, James Gurney will deliver a lecture on composition. I'll post some pictures tomorrow. adorable. this makes me smile!